Rabbi at Cracow; flourished in the first half of the sixteenth century. He was the author of "Mirkebet ha-Mishneh" (The Second Chariot), a Judæo-German Biblical concordance, preceded by a lengthy introduction. The volume—now very rare— first appeared at Cracow in 1534, but was reprinted in the same city, in 1584, under the title "Sefer R. Anschel." Wolf (in "Bibl. Hebr." i. 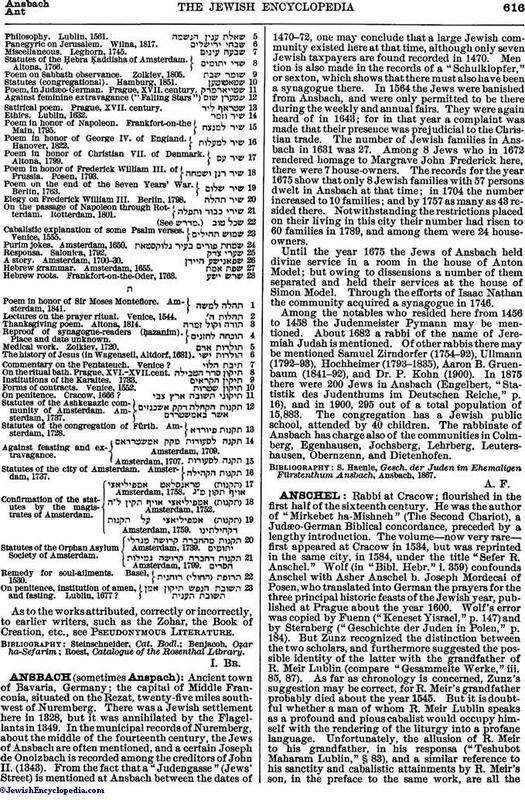 359) confounds Anschel with Asher Anschel b. Joseph Mordecai of Posen, who translated into German the prayers for the three principal historic feasts of the Jewish year, published at Prague about the year 1600. 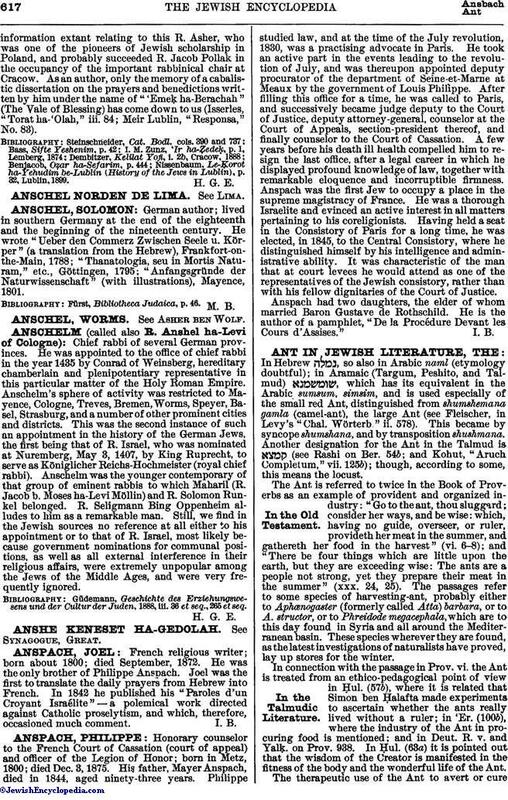 Wolf's error was copied by Fuenn ("Keneset Yisrael," p. 147) and by Sternberg ("Geschichte der Juden in Polen," p. 184). But Zunz recognized the distinction between the two scholars, and furthermore suggested the possible identity of the latter with the grandfather of R. Meir Lublin (compare "Gesammelte Werke," iii. 85, 87). As far as chronology is concerned, Zunz's suggestion may be correct, for R. Meir's grandfather probably died about the year 1545. But it is doubtful whether a man of whom R. Meir Lublin speaks as a profound and pious cabalist would occupy himself with the rendering of the liturgy into a profane language. Unfortunately, the allusion of R. Meir to his grandfather, in his responsa ("Teshubot Maharam Lublin," § 83), and a similar reference to his sanctity and cabalistic attainments by R. Meir's son, in the preface to the same work, are all theinformation extant relating to this R. Asher, who was one of the pioneers of Jewish scholarship in Poland, and probably succeeded R. Jacob Pollak in the occupancy of the important rabbinical chair at Cracow. As an author, only the memory of a cabalistic dissertation on the prayers and benedictions written by him under the name of "'Emeḳ ha-Berachah" (The Vale of Blessing) has come down to us (Isserles, "Torat ha-'Olah," iii. 84; Meir Lublin, "Responsa," No. 83). Nissenbaum, Le-Ḳorot ha-Yehudim be-Lublin (History of the Jews in Lublin), p. 32, Lublin, 1899.